Sorry for the delay, yet again real life intervened but don’t take it as a slight on the new series as (spoiler alert) I’m really enjoying it. We begin seconds after the closing seconds of the first episode, another nice Hartnell vibe! It’s good to see The regulars thrust into a new adventure straight off and I loved Ryan’s reaction to being on a alien planet, it also gave Jodie a chance to be very Doctorish straight away on the spaceship, to be honest she’d won me over in the first episode but it was good to see her start to develop her Doctor more. I think Graham may end up being my favourite and gets all the good lines. 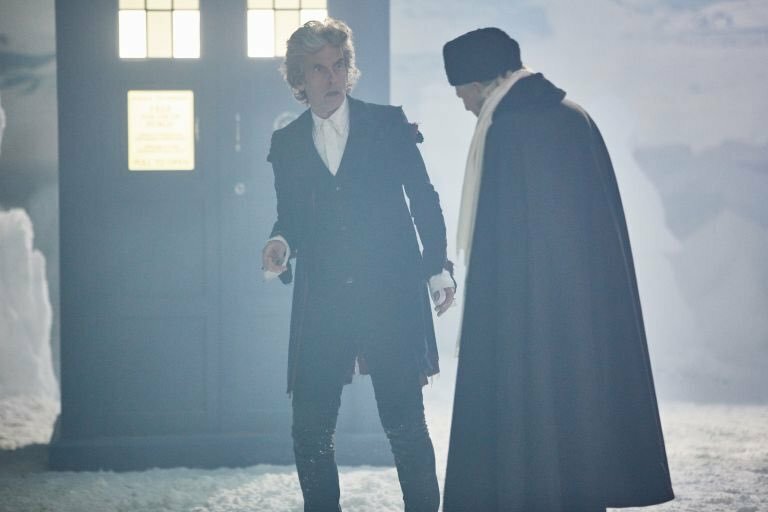 The episode looks and feels so cinematic, it still feels as epic as the Moffat era just in a different way though it’s nice that we seem to have returned to stand alone stories where the universe and timestream aren’t at stake every week, stories can feel just as dangerous for the characters without universal threats. The story feels very 60’s in tone which is no bad thing, I can imagine this as a 6 parter back then with different settings each episode (and one of the regulars would’ve slept through the ship voyage so they got a week off!! ) The two guest characters get fleshed out just enough to keep you interested and don’t take away from developing the regulars, they feel like real characters and their reactions also feel natural. The idea of a planet wide killing experiment also feels very Terry Nation too continuing that 60’s feel, maybe Chris Chibnall had been binge watching the first few seasons! I liked the smothering cloth creatures and the solution to defeating them coming from brains not brawn. I did start to groan when they were talking to The Doctor as it seems to be setting up a story arc about The Doctors mysterious past and that goes against the new feeling of this series. We end with The Doctor finding the TARDIS and whilst it’s totally predictable it’s a lovely joyful moment and we get the obligatory redecorated interior scene, I wasn’t 100% convinced at first but it’s since grown on me. So finally after months of waiting Jodie’s Doctor has arrived and how refreshing that nobody barely knew a thing before transmission, I have tried to avoid spoilers every series but this was by far the easiest to do that, personally I think not knowing is a better way of viewing. The episode opens with us meeting the new companions and immediately I warmed to them, they felt real to me and I liked that there were connections between them so they weren’t just three random strangers though sure it’s not just me that wished Grace was also going to be part of the regular cast. The story itself is slight but then that’s as it should be for a introductory episode, Doctor Who is full of homages and this time it’s the turn of Predator. The alien design is a nice one and wearing the teeth is a good touch and I have a feeling we may see them again, at least Chris Chibnall is keeping good to his promise that we get new monsters. The show looks so good too, it feels very cinematic and grand in places though not quite as colourful as I maybe expected from the promo images. Then we end with that wonderful new version of the theme kicking in, it feels fresh but so near to the original at the same time. How lovely to have my favourite show back and on such great form, these next nine weeks are going to be fun. So over the last few weeks we’ve had a lovely teaser during the World Cup, wonderful promo images, the comic con panels and trailer. It’s starting to feel like we’re close to the return. Allthough I’ve looked forward to every series as it’s arrived this one feels so fresh and different. I’m genuinely excited like a small kid again and from the little I’ve seen I have a feeling we’re about to enter a golden age of Doctor Who. I’m feeling all this from the little we’ve seen, Jodie just feels very Doctorish to me and it’s been so refreshing to not have to make a big effort to avoid spoilers for once. Sadly there still seems to be a small section of fandom who are dead set against a female doctor and cross the line in how they express this particularly to the female fans. It seems they’ve missed the central message of the character they claim to love. Hopefully they’re a minority who will shrink even more once the show airs and everyone takes Jodie to their hearts. What a lovely logo. Each bit of the new series I hear about makes me look forward to it even more. Much as I’ve loved the last few series Series 11 feels so unknown and exciting and I have the feeling we’re about to enter another golden age. So we come to the end of Peter Capaldi’s too short time as The 12th Doctor which also serves as the end of Steven Moffat’s time in charge. This feels very much like a epilogue rather than a story in it’s own right and on reflection I think it’s a shame they didn’t hold the final 2 episodes over until Christmas and we could’ve had a epic 3 nights of Who over the Christmas weekend. I suspect on rewatching in the future I’ll put all three episodes together. It’s a nice little story and seeing the first Doctor realise what he will become gives some great scenes though without wishing to jump on the bandwagon his sexism seems wrong, The first Doctor was never that overtly sexist and it seems the writing is confusing the character with the original actor, they should’ve stuck with jokes about guitars and Sonics similar to what they did with John Hurt’ s Doctor. Thankfully these bits are kept to a minimum. 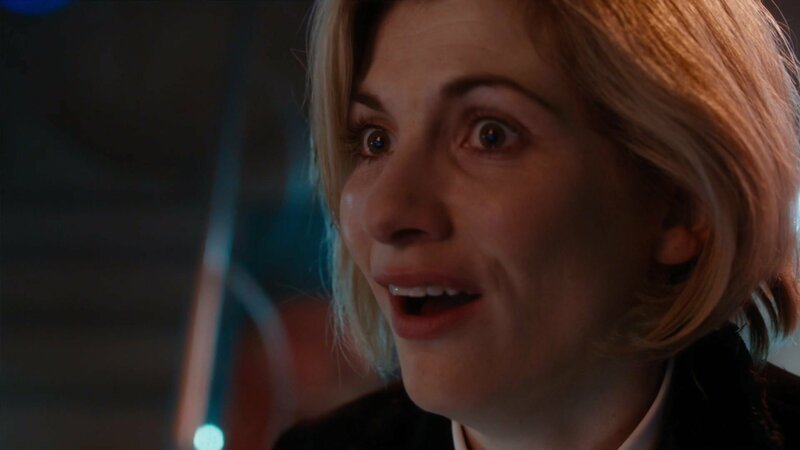 The idea of The Testimony is a good one and whilst seeing the wonderful Bill Potts again is very welcome for one second when the first Doctor is offered to see her again I thought Susan was going to appear.Having said that Bill is marvellous and although the twist is obvious Pearl Mackie sales the whole thing well. The Captain is a bit of a one note character but it’s nice to enable Mark Gattis to have a goodbye role and channel his inner Brigadier. The dangling good Dalek thread being picked up was a pleasant surprise and I loved seeing the old console room, it just feels so timeless and the opening morph from Hartnell to Bradley is also wonderful. David Bradley does a good job of portraying the first Doctor and captures many of the mannerisms that Hartnell used. How wonderful too that we get clips of black & white Hartnell broadcast on Christmas Day in 2017 and it just feels right. I’m hoping the blu ray may include some extra recreated Tenth Planet scenes too. Then we come to the conclusion as the Testimony enables The Doctor to say goodbye to his three companions and he gets all his memories of Clara back though yet again Matt Lucas steals the scene. They give Capaldi some nice speeches to round things off even if they feel like he’s staying the obvious (I took it to mean learn from his mistake of starting off mean and rude!). Peter Capaldi has been a truly wonderful Doctor and one who I feel will be looked back on with much fondness and it’s sad to see him go. Jodie’s short scene is good, I loved the fade from his eyes to hers and the “oh brilliant” line with such a look of glee is instantly Doctorish. I eagerly await her first episode though I think The Doctor needs to stop regenerating in-flight! Is it the Autumn yet? 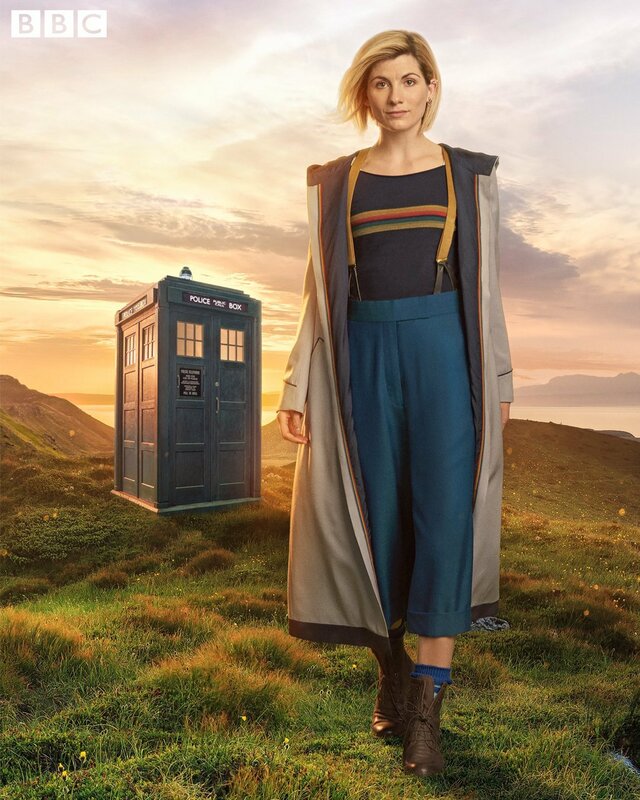 So the traditional new Doctor in new costume photo has been released. At first glance it looks strange which I realise is exactly the right response, she is meant to be a 2000+ year old alien, one that has previously wandered round with a stick of celery stuck on their lapel, a completely impractical 20 foot scarf and a coat of clashing colours. So ignore the social media keyboard moaners, after all its only a costume, I’m more interested in her character. Sadly Deborah Waiting who played Victoria passed away today. Victoria was part of a classic TARDIS team in the sixties and was part of some of the she’s high points. My first memory of Victoria comes from that striking target book cover of The Ice Warriors and seeing her constantly referred to as the screaming companion back in the 80’s when I was discovering the she’s past. Unfortunately back then none of her stories existed in their entirety and unlike today there was no easy way to watch the orphaned episodes so my first time seeing her in action was 1992 when Tomb was returned and released on video. I was immediately struck by the chemistry between the three leads and her performance is so sweet especially in that wonderful quiet scene between her and Patrick talking about loss. Since then we’ve been lucky to have 3 further adventures released on DVD and the others are there on audio so we can all enjoy her performances. I was never fortunate enough to meet her but listening to commentaries and watching dvd interviews made me feel like I had, she always seemed so down to earth, full of humour and friendly and today’s outpouring of tweets in tribute to her seen to back that up. Doctor Who was lucky to have her.